I have rubbed shoulders with a lot of stars in my life but this has been largely confined to music (especially hard rock). Hollywood was another beast and I never really tried to get my foot into that door. But I did interview a man that for years was one of the very top men in his field in old school Hollywood, world renowned photographer Bob Willoughby. As a big fan of Audrey Hepburn I saw his name again and again and in 2005 I asked him for a chat for my PIZZA 2006 magazine (on the specific subject of Audrey), which he granted. So I called him at his home in France and he told me that Audrey was so special to him that he was only glad to talk about her. Bob passed away in 2009 but his memory lives on. His photographs of Audrey Hepburn are timeless. Enjoy the interview. If we go back to your first meeting with Audrey, what do you recall today from that day? – It was right after her having shot “Roman Holiday” (1953) in Rome and Paramount wanted her to be seen in the media so they set up a session with their photographer and they also invited me. I was impressed with the respect that everybody was showing her. People that work with movie stars are inclined to behave in certain ways, but it was obvious that everybody really treated her with respect. She was a lady. When we were done, somebody suggested that that it would be a good idea if she met Jerry Lewis and Dean Martin as they were in a studio next door, so I tagged along. They didn´t know who she was but Martin was a real gentleman about it and showed his decent side, so we got some pictures from that. I then asked her if I could get some pictures at her home and she agreed to that. She was still doing the odd performance of “Gigi” so she had a place in downtown Los Angeles. So we went over there and I got some pictures of her unpacking her bag and of her reading a private letter. Then I took the pictures of her by the window which became so famous. Those shots belongs to the ones that I´m the most happy with as a photographer. I have seen them everywhere and they still pop up all the time all over the world. It was the beginning of a long friendship. Did you get any pictures with her and Gregory Peck together? – No, they had already shot “Roman Holiday” and it was Audrey that Paramount wanted to promote. That movie made her a star and I thought they had picked the perfect actress to play a princess. I know people that have met royalty and they have said to me that they have only met one real queen, and that was Audrey. Everybody that ever met her loved her. She had something. I watched “Roman Holiday” again not long ago and it is still a great movie. How was your working situation back in those days? – I was a freelancer. The film companies had their photographers but they knew that I got published in a lot of magazines so they used to give me the access that I wanted. I used to visualize what type of pictures that publications like LIFE and LOOK could want, and then I made sure that they could get them from me. If it was a movie that I thought they may not find that interesting, then I concentrated on the fashion side. This worked well with LIFE magazine for me. So I used to get my pictures printed and the companies liked that. I covered over 100 Hollywood productions. In the 50´s and 60´s I was published on a weekly basis in all the major publications so it worked very well for me. Isn´t wonderful to see all these classic movies restored now and re-issued? – Yes, it is very nice to see them again, it really is. So when did you meet her again? – It was when she made “Green Mansions”, about six years later. That was the film where she worked with a fawn and other animals. – Yes. And this is a remarkable story. Her husband, Mel Ferrer, directed it. He wanted to see a natural bond between Audrey´s character and the fawn so the handler said that the only way to achieve that was for Audrey to spend her time with the animal. So Audrey more or less became a surrogate mother for a time. And it didn´t take her very long to really bond with the fawn. It had another name but it was called Ip during this period. Audrey was such a natural, she handled it with such abundance of affection. Ip used to curl up at her feet when she was reading her script. It was quite a sight to behold. She was so calm and all the animals liked her. The handlers noticed this as well. There were tropical birds and other animals. You took pictures of Audrey and Ip that are classic today. – Yes, and it was fantastic. We took pictures in Beverly Hills when Audrey went shopping with Ip. I suppose you can understand that people in cities like Los Angeles are quite used to seeing movie stars, but they couldn´t help but stare when Audrey and Ip walked by. They left Audrey alone, but they stared. And that is another thing that I noticed with Audrey, that people left her alone. She was a very private person. She was never unpleasant but people had a great deal of respect for her. Nobody in the film crew would disturb her. How often did you see her after that? – I did a few jobs, “The Childrens Hour” (1961), “Paris When It Sizzles” (1962), “My Fair Lady” (1963) and “Two For The Road” (1966). I had decided never to mix my work with my personal life so I had told my wife that I would never bring any film stars to our home. There were three exceptions, of which Audrey and Mel was one. I think she liked me because we were both very private persons. She never stayed in hotels but prefered to rent a place when she was in town for work. They visited us when their son Shawn and our son Christopher had their first birthdays together and I got some lovely pictures that day. It happened that we met with me taking no pictures as well. I met her when she did “Breafast At Tiffany´s” (1961) but I didn´t take any pictures that day. After “Two For The Road” she didn´t work for a decade, did you meet her during this period? – No, I was busy with my career. She wanted to have some private time with her family. Did she ever talk about her days during the war in Holland? – No, and I never asked. She was very protective of her father and I don´t think she wanted to talk about that period. She never mentioned it and I thought that it was the kind of thing that was private and that the subject was hers to pick up, not mine. She did mention how she came to London after the war and that she was rejected at a ballet school for being too fat. She did mention that. Do you have a personal favourite from all your photo sessions with her? – No, it was always special to photograph her. Did you know that she was ill before she died or did it come as a horrible surprise? – I felt deep down that maybe there was something wrong with her when I saw pictures of her with children in Vietnamn when she travelled with UNICEF. She didn´t look well. Around the same time I met a woman who worked for UNICEF when I did a tv-show in France, and she told me that Audrey had said “My face is needed to show the world what the situation is for these children” and I know that she felt that she had to give something back since she herself had received help after the occupation in Holland. I knew her well enough to know how strongly she felt about the children in Africa. It hurt her a lot and she felt that she had to do something. I think she actually gave her life for them. When did the idea of a book with photograps come up? – Well, it was the Japanese that brought it up first. She was always enormously popular over there. Then I started to go through my files when I moved to France and I could see that there was good photographs that could be used and there has been a few books now. The 2002 book, “Audrey, An Intimate Collection” is out in Germany in a new print now. Do you feel that you have been getting proper credit for your work as a photographer? – Yes, I have been very lucky. I achieved a Lucie Award in New York a couple of months ago. It has been a good journey. 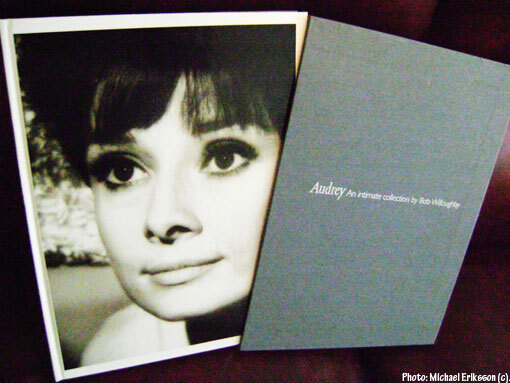 The book pictured above is the 2002 print of “Audrey, An Intimate Collection” by Bob Willoughby (Vision On Publishing).